It's time for a mouthwatering good time. 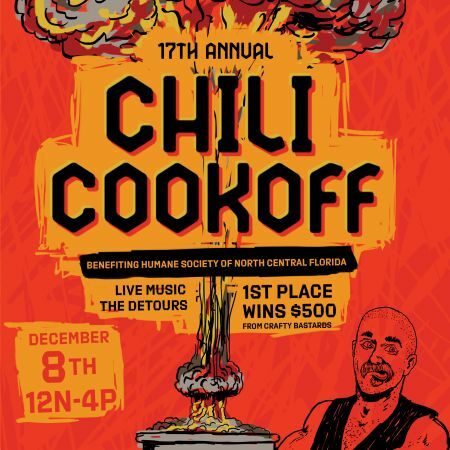 Join us for our 17th Annual Chili Cook Off. This year we are raising funds and awareness for the Humane Society of North Florida. Bring your taste buds and bring your friends 'cause you won't want anyone to miss out on this day! First place winner receives $500 from Crafty B'astards Restaurant & Pub plus a place on their menu! Live music from The Detours with the lovely Cindy Kitchens Snider headlining! Cold Beverages from Crafty B'astards Restaurant & Pub! Plus free gift wrapping, raffles, & more!